Some photos from a four-day street retreat I did in September here in New York. 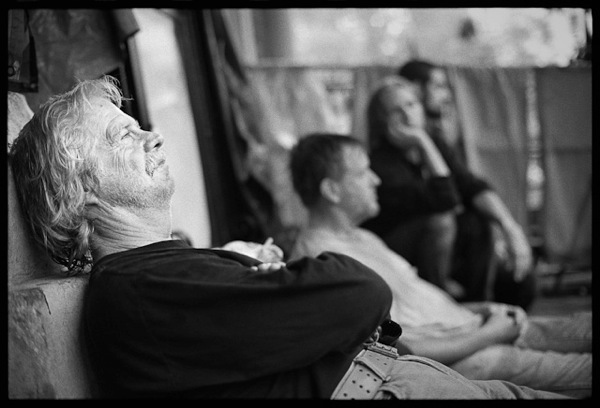 Street retreat is an American Zen practice, I believe invented by Bernie Glassman, of spending a short time living and sleeping on the streets. It brings us into contact with poor and homeless people and those who help them, and gives us a taste of takuhatsu, and of the homelessness of monks in the time of the Buddha. This September was my second retreat. We had a group of eight people, led by Genro Roshi. We ate at churches and Christian soup kitchens, mainly the Bowery Mission. Circumstances were rougher than I expected; it rained most of the retreat, and major confrontations were beginning between Occupy Wall Street and the NYPD, so it was hard to find safe and dry places to sleep. We spent one night in Zuccotti with OWS, one at The Interdependence Project, and one going back and forth on the Staten Island Ferry. I shot these on a Nikon FM2 35mm with Tri-X. Didn't want to carry a digital camera with me, or anything that would mind too much getting wet.